The ROSE Foundation (Recycling Oil Saves the Environment), is a national non-profit organization established to promote and encourage the environmentally responsible management of used oils and related waste in South Africa. Funded by the major stakeholders in the lubricants industry, to enable them to meet their environmental and extended producer responsibilities, ROSE proves that sustainable recycling protects the environment and creates widespread employment opportunities. 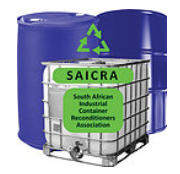 SAICRA represents reconditioners of industrial containers and new drum manufacturers, promoting responsible environmental collection and reconditioning of industrial containers in South Africa.